A bill that would raise the speed limit to 75 miles-an-hour on many miles of interstate highways in Iowa has cleared its first hurdle in the state senate. Senator Randy Feenstra, a Republican from Hull, said 75 is the posted speed limit in neighboring South Dakota and the data he’s seen doesn’t indicate “an uptick” in traffic accidents and fatalities there. Senator Wally Horn, a Democrat from Cedar Rapids, supports a higher speed limit, too. Horn and Feenstra signed off on the bill so it now is eligible for a vote in the Senate Transportation Committee. Senator Chris Brase, a Democrat from Muscatine was also on the subcommittee, but he opposes the higher speed limit. According to Iowa DOT data, the average speed on Iowa interstates is about 72 miles an hour, just above the current speed limit of 70. Thomas Stanberry, a lobbyist for the Iowa Insurance Institute, told the senators a higher speed limit means a greater number of accidents. “The property and casualty industry has a lot of data that shows at five mile per hour increments in the increase in the speed limit, particularly interstate speed limits, the number of accidents increases substantially,” Stanberry said. Legislators raised Iowa’s speed limit from 65 to 70 in 2005 and Iowa is now among the 20 states that have 70 as the upper speed limit for interstate traffic. Sixteen states have a speed limit of 75, while the remaining 14 states have posted speed limits of less than 70 miles an hour. 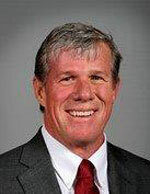 Senator Brad Zaun, a Republican from Urbandale, is the sponsor of the bill that would raise Iowa’s speed limit to 75 miles an hour and he’s “encouraged” the bill is now eligible for a committee vote. Seventy-five is the posted interstate speed limit in states to Iowa’s west like South Dakota, Nebraska and Kansas. The speed limit is 70 in Minnesota, Missouri, and Illinois. Wisconsin is the only neighboring state to have a lower speed limit. Sixty-five is the upper limit on all rural and urban interstates in Wisconsin.